April's update includes a wonderful bunch of wood inlay works from, not only Buchschmid and Gretaux, but from some unkown authors. Terry Keeley has come up with a very interesting example of Buchschmid and Gretaux's "Oberhofen Castle" which appears to have a lot of extra detail not found in the usual examples of this work. The veneer selection is especially impressive in this picture, the burrs or burls fulfill their function superbly, just take a look. At the bottom of this page is a version of "Neuschwanstein Castle" made by "K". This is a marquetry artist we know nothing about! 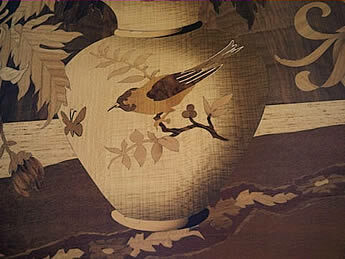 Check it out and see if you can recognise the picture or the marquetry artist. 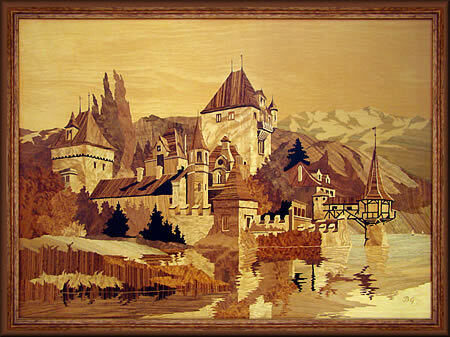 Our April 2010 update brings you another of those Buchschmid and Gretaux "Oberhofen Castle" wood inlays, but this one has a special difference to those you see on page 25 of this series. That difference can be seen in the bottom right hand corner of the picture. It is, of course, the classic BG signature which is missing from the other versions of this title. 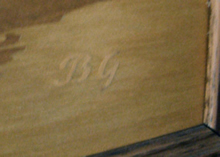 A possible reason for the inclusion of the signature on this picture and not on the others, is that this is a rather larger example of the "Oberhofen Castle" wood inlay. This picture measures 34 x 25 inches (or 87 x 64 cms approx) - thus making it a somewhat larger piece of Buchschmid and Gretaux wood inlay than is the norm. The largest normal size of a B & G picture as listed in their catalogue is 24.5” x 17.25” (or 62 x 44 cms approx). This makes Terry's picture roughly 30% larger (and more detailed) than the usual examples of the largest of the B & G works. This is a very fine piece in our opinion, it is wonderful to see a larger inlay than we are used to. The extra detail that B & G were able to add makes this picture all the more interesting. Many thanks to Terry Seeley for sending it in for us to enjoy. 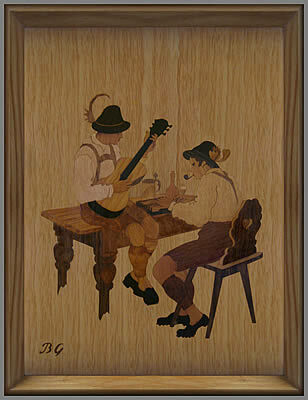 The next picture with the two musicians is titled "Zither Player" and is intended as an accompaniment to another wood inlay piece titled "Dancing Bavarian Couple". This picture would have been made in the 1960's. Our next Buchschmid and Gretaux picture is another example of the well respected Chrysanthemum series. 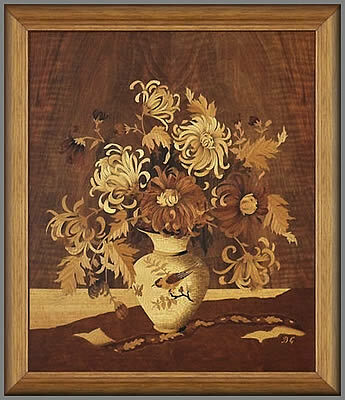 The design of the central theme in this picture is the Chrysanthemum motif as seen in our other example on page 23, but this wood inlay differs in that it does not contain a border as seen in the earlier picture. Interestingly, this particular wood inlay may well have been cut from the same "veneer packet" as the page 23 example. The only difference of note is an extra leaf added to the lower tip of the large left hand leaf which extends into the "white" table surface. The large border on the page 23 wood inlay promoted the picture into the "Series 1" category. The picture of the same title displayed on this page is not listed in the smaller series 2 or 3; so it is possible that it may have been cut down to fit a smaller frame. This was known to happen to some of the B & G wood inlay pieces, but, as Herr. Otto Chlup told us about this practice, it was mainly done by dealers or resellers, in order to fit the pictures in to specific frames they had in stock. Whether or not this affects the actual value of the wood inlay works in any way, is open to basically, subjective opinions. 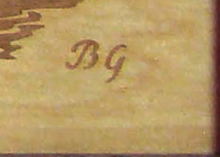 As the resizing was done "in trade" and does not encroach on to the inlay work itself in any visible way, it is very difficult after many decades have passed, to be able to say with any authority which picture had been modified - or was released from B & G in the normal course of trading as a "special" one-off item. Whatever way though, at least we can say that each and every B & G wood inlay piece is a beautiful example of its genre and deserves to be treasured. 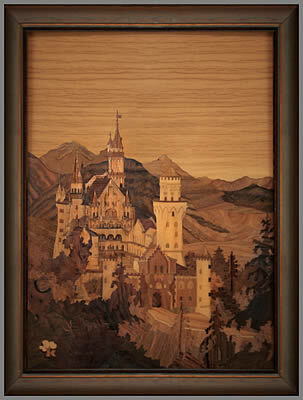 Our final wood inlay picture for this April update is another example of the "Neuschwanstein Castle" subject. 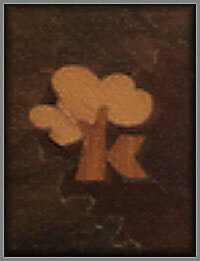 This picture, although it has been made as a wood inlay design by B & G in both portrait and landscape orientations, is actually made by someone, or studio, who signs themselves with a "K". The K itself has been transformed into a tree design and makes a rather attractive logo. Unfortunately we do not have any information as to who this wood inlay maker or studio is. If any of you, our wonderfully knowledgable readers, recognises or knows who this mysterious "K" is, would you soothe our furrowed old brows and e-mail us an answer to this conundrum. We would be most grateful to you, thanks for your help. Two views of the BG signature from the above picture of "Oberhofen Castle"
Click the above button to return to page 25 of "Can You Help"